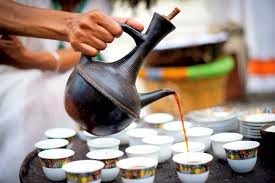 Ethiopia’s coffee has been ranked as the best in the world by an international group of coffee connoisseurs. Not surprisingly, coffee is a top export for the country. But at home it is a source of pride. International coffee experts travel the world to find the best tasting cup. They keep coming back to Ethiopia, where importers like Morton Wennersgaard say the climate produces quality coffee beans. “You have different ancient varieties referred to as Ethiopian heirdom. They are grown in places with perfect soil, perfect altitude, and micro climates that are really suitable for coffee processing, such as drying and things like that,” he explains. Finding the best beans is a matter of taste, literally. The intense process is known as cupping - tasting and comparing coffee from different roasted beans, grading and then pricing them. But before international experts come to taste, coffee beans go through analysis in small coffee labs, where Helen Assefa describes the process. “When the coffee comes to the lab, we assess the coffee quality first by recording the details. Then we weigh the moisture level and we screen the beans for analysis. After that we grind the coffee beans and taste the samples. At the end we check for defective beans," Assefa explains. And that screening is a very difficult and lengthy process, says lab worker Mubarik Abaoli. “We sort out the defects manually, by hand. And we sort out the defect according to the defect types. The types are immature, paste damage, foxy, black - all has to be sorted out according to the severity of the defects,” Mubarik Abaoli says. Nevertheless, Ethiopia is cashing in on its coffee reputation with consumers in more than 120 countries and a yearly export revenue of more than $840 million.